I will reorder it as soon as possible. When I leave my dog at home alone she panicks, destroys everything and cries until I return home. With these drops I'm seeing some improvements as she is calmer and cries much less. Fantastic and I recommend it! My cat is very 'hysterical'. She is always very distrustful of everything, blows to her brother, very agitated, I have to say that the drops calm her so much when she takes them in the morning,. She plays in the evening, purrs, eats and sleeps quietly !!!!! No more stress !!! 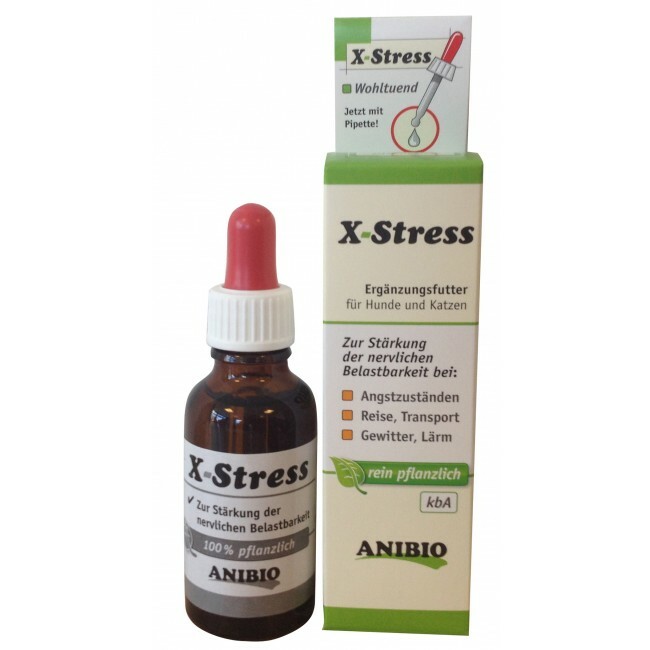 If you want more detailed information about this product, please search over the web for the manufacturers official page by inserting "Anibio (eu) X-Stress" or contact our customer service. - Drops for cats and dogs to be added to food or directly 2 hours before the stressful event, have a calming effect. We recommend the use in the case of transportation, travel, veterinary examination (in the case of fear of the vet), contest or exhibition, thunderstorm, fireworks or if your pet is left alone, after surgery, an accident, or shock, in case of aggression or nervousness. Anibio X-stress helps to rebalance the behavior and the natural defense mechanism against stress. I have been using it for a month and I was hoping to see my little hary friend with less anxiety. I use it successfully to calm my dogs down when there is a thunderstorm and generally during stressful situations. The results are evident just after 3 days. Shake before use. The stress drops are administered directly or as a dietary supplement. Use two hours before each stressful event. (1 full dropper = about 20 drops). Prolonged use: 1 x per day 5 days prior to a stressful event. Water dem., extracts of: natural hawthorn (Crataegus oxyacantha), passion fruit (Passiflora incarnate), lavender (Lavandula angustifolia), orange (Citrus aurantium), dextrose. Analysis of the other ingredients: crude protein 0.5%, raw fat 0.3%, crude fiber 0.3%, crude ash 0.2%.